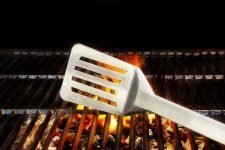 The food is prepped, the weather’s perfect, and good company’s meeting at your favorite outdoor locale. 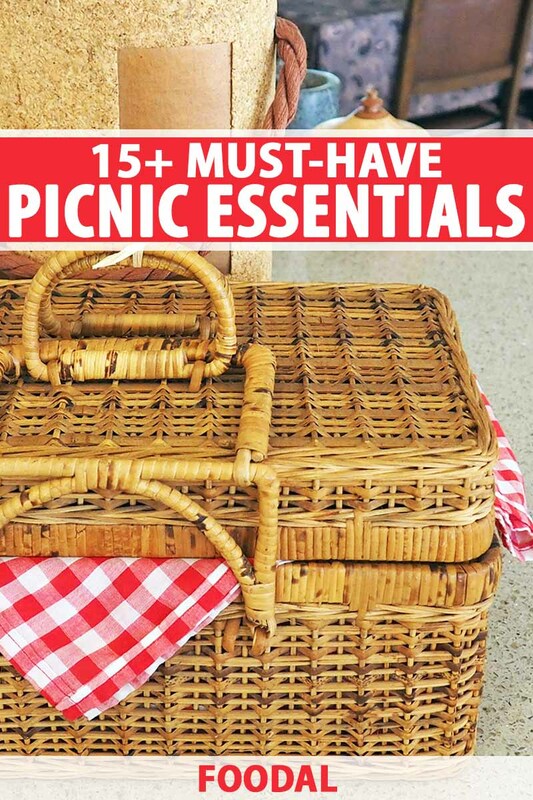 But before you head out on your picnic, take a moment to scan our checklist – it’ll ensure that you have all the essentials needed for a perfectly packed basket and avoid disappointment! 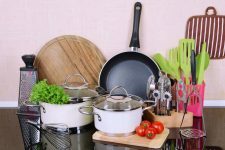 Just be sure to pack your favorite foods and beverages, flatware and cutlery, plus these other essentials, and you’ll be ready for anything. 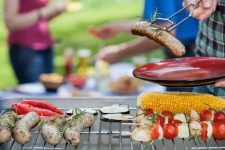 You won’t need every item listed every time you dine outdoors, but having our checklist at the ready – and our must-have picks – will ensure nothing gets forgotten and you’ll always be prepared. 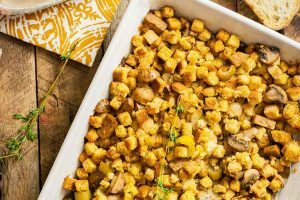 If you plan to sit on the ground to lay out your spread, remember to bring along a blanket. 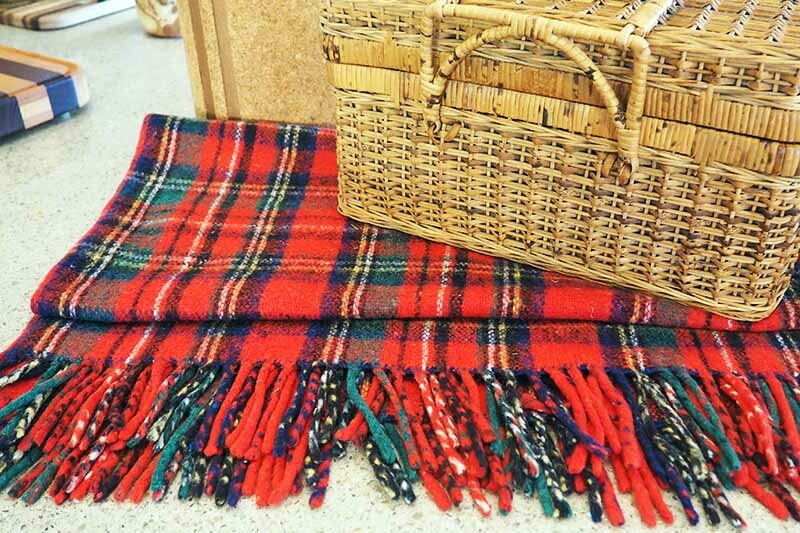 Any blanket will do, but if the ground is damp it’s nice to have one with a waterproof backing – or sand-proof, if you’re heading to the beach. A blanket helps to insulate your wine bottle. Photo by Lorna Kring. Wrapping in a blanket for transport can also help to keep your bottled beverages protected and cool. 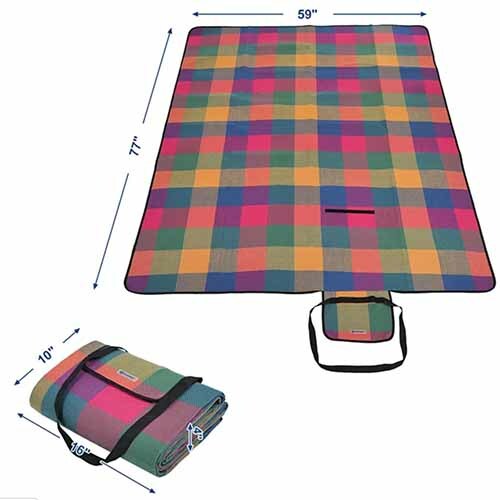 This checkered outdoor blanket from Freeport Park is hypoallergenic, accommodates 4, has a sand- and waterproof backing, and ground debris doesn’t stick to the soft acrylic topside. Plus, it folds into a compact 10 x 16 x 4-inch packet with a handle and shoulder strap for easy carrying – a convenient touch as most blankets won’t fit into a basket along with everything else. 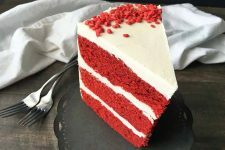 Find it at Wayfair.com. Depending on what’s on your menu, a selection of condiments will round out your meal. 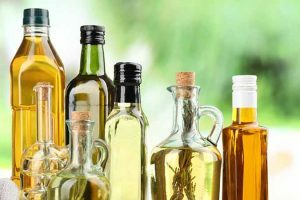 Dips, ketchup, hot sauce, mayonnaise, mustard, and salad dressings are all welcome additions, but packing the full-sized containers takes up way too much space – especially when you only need small amounts. Instead of bringing along large containers, repackage them into travel-sized squeeze bottles. These 2-ounce condiment bottles from Evriholder are the perfect size for a picnic basket and are made of easy-to-squeeze, BPA-free silicone. They’re available on Amazon.com. 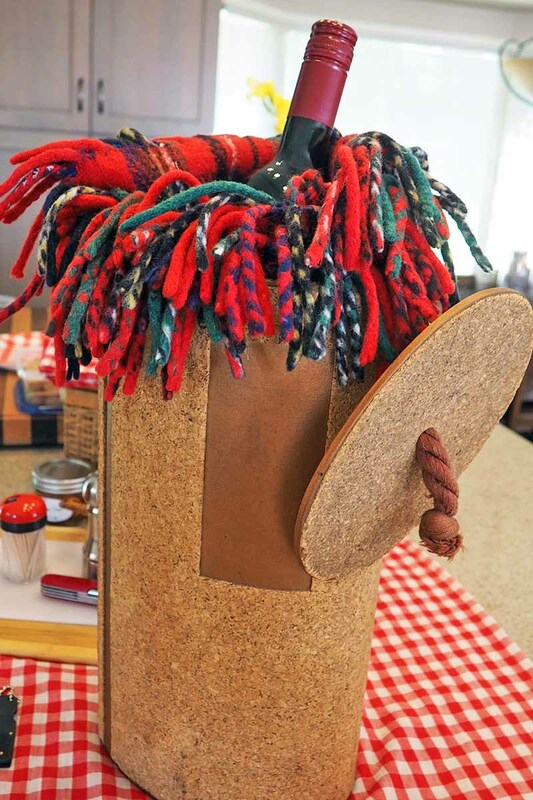 Pouring condiments becomes an easy project when a funnel is involved. Photo by Lorna Kring. So, how exactly are you supposed to get your dips, sauces, and spreads into those tiny bottles? 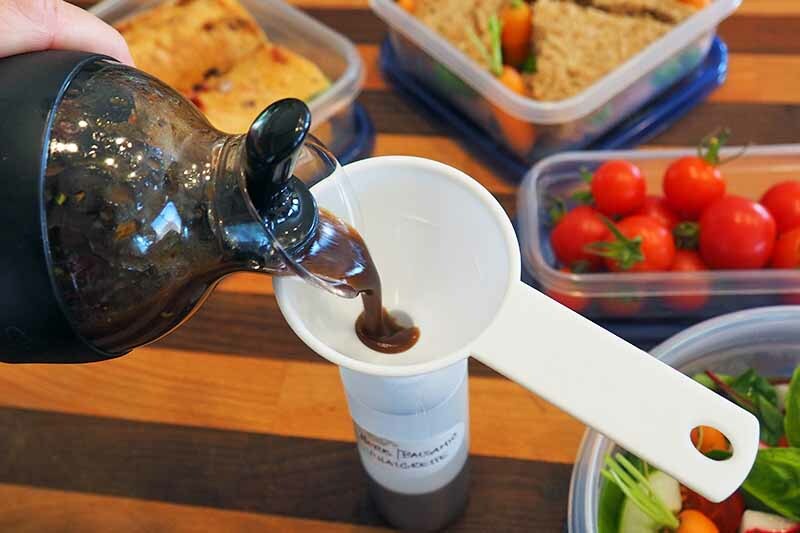 For quick and clean transfer of condiments from one container to another, a small funnel gets the job done. 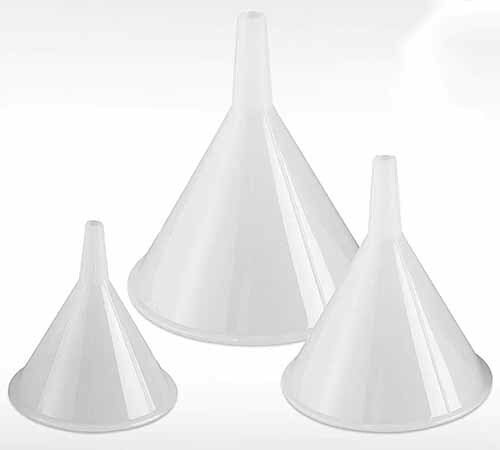 Pick up a pack of 3 BPA-free, food-grade funnels from Hutzler. These are available on Wayfair.com. Few things are as frustrating as being in the middle of the woods only to discover there’s no way to open a bottle! 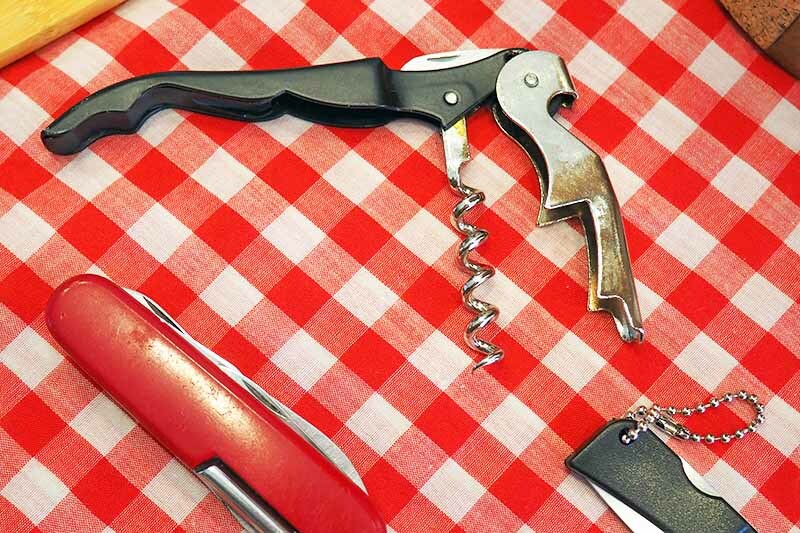 If you’re packing any kind of beverage in its original container, such as beer, sodas, or wine, be sure to include a corkscrew with a cap opener. 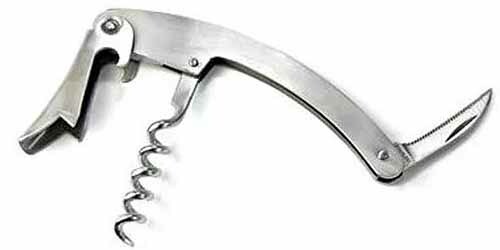 A waiter’s corkscrew folds up nicely to take only a tiny amount of room in your pack, and most will also have a cap opener – like this one from Cuisinox. It’s available from Wayfair. 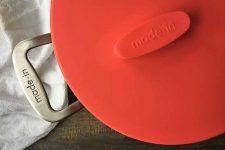 If you’ve ever tried cutting hard cheese on a thin, disposable plate held in your lap, you’ll know that a small, lightweight cutting board is a smart piece to bring along. 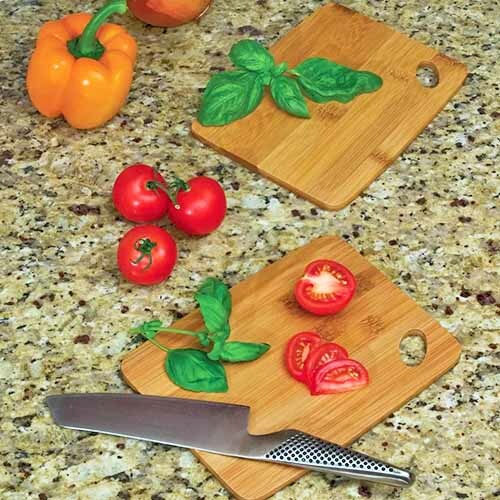 Very handy for slicing cheese, fruit, meat, pickles, or sandwiches, these can also double as a tray or plate. 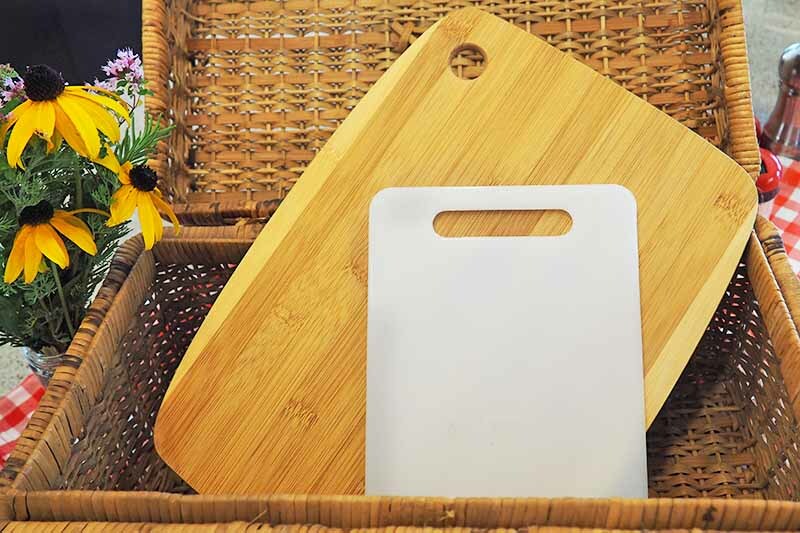 Look for ones that are thin but rigid, like this set of two bamboo cutting boards from Lipper International – they measure only 6 x 8 inches with a thickness of just .25 inches. Available on Wayfair.com. Hopefully you won’t need it, but a small first aid kit is a good safety item to bring along as well. 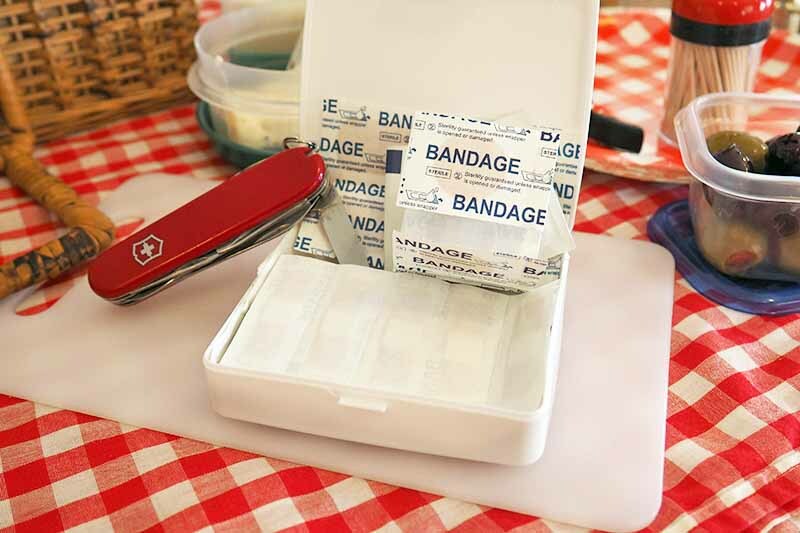 A basic first aid kit is always worth the space in your pack for your outdoor excursion. Photo by Lorna Kring. 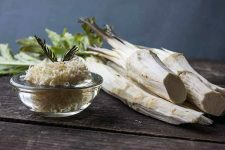 Nothing elaborate, just a few different sized of band-aids, sterilizer wipes, and a couple of antihistamine tablets for insect stings will take care of most minor mishaps. 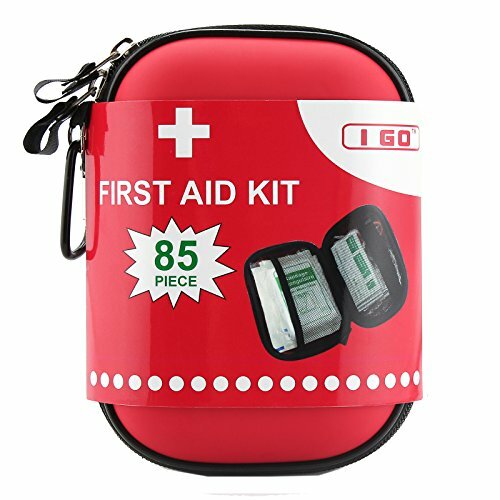 This 85-piece first aid kit from I GO offers everything you might need in a compact container, including FDA-approved sting relief packages, bandages, gauze, and more. Available on Amazon, you get your choice of a red or black carrying case. 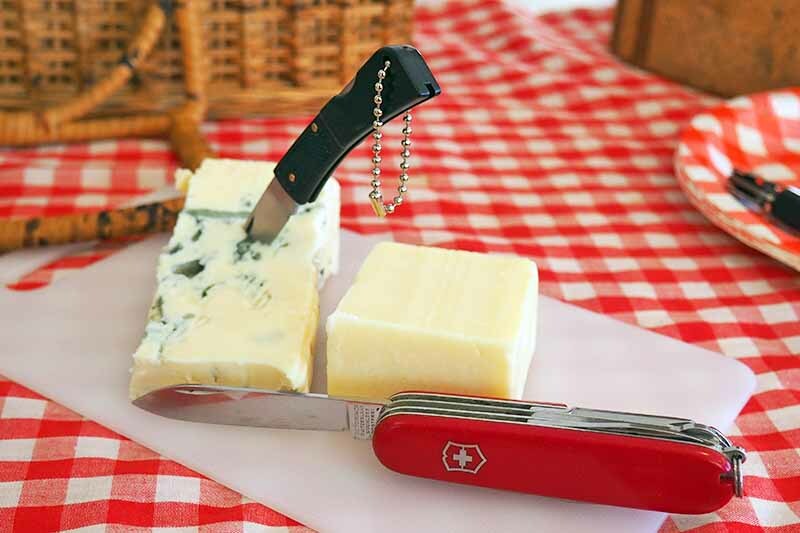 Essential for the dedicated picnicker, a small folding knife will serve a host of chores and is an absolute must if you’ve brought a selection of cheeses, fruit, meats, or pickles. And if you have two, toss them both in – more is better here! 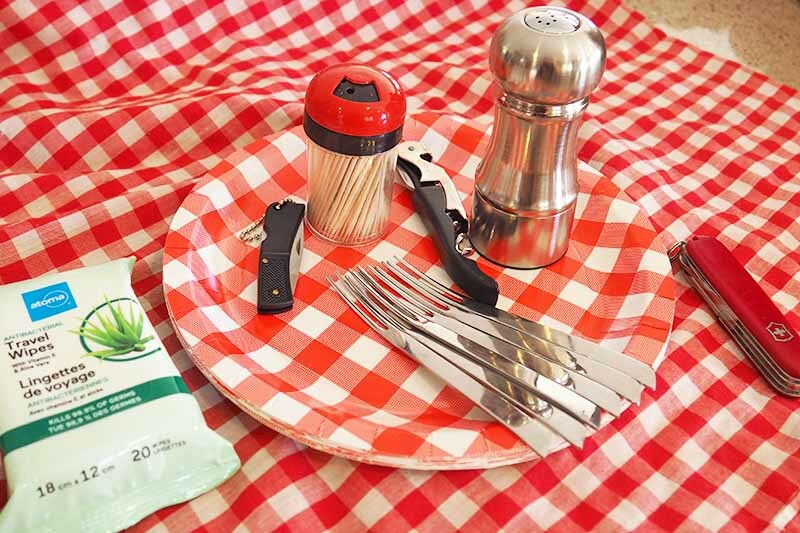 A few folding knives should be included in your picnic kit. Photo by Lorna Kring. 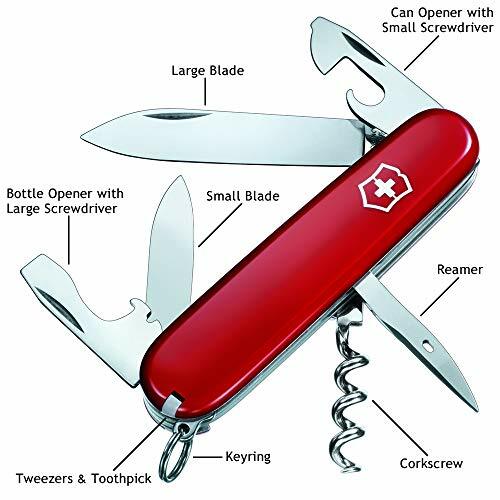 My old Swiss Army Knife lives in my picnic basket because it has all the essential tools needed for dining en plein air – just like this Red Spartan model available on Amazon.com. 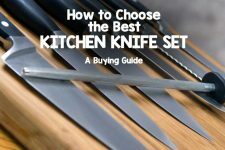 Plus, since this style of knife folds up for easy storage, it’s much easier and safer to transport than your traditional paring knife or cheese blade. Just remember to give it a quick wipe before you fold it back up again! 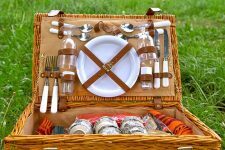 Picnicking generally takes place during the warmer months of spring through fall, and foods need to stay chilled. Ice packs are a good option, but they also take up precious room – cue the frozen sports bottle! A frozen water bottle doubles as a drink and a handy ice pack. Photo by Lorna Kring. Freezing water in a sports bottle serves two purposes: it will keep your basket contents cool without taking up any extra room, and as it melts, you’ll have icy cold water to sip on. Remember to leave an inch of headroom when filling the bottle to allow for expansion as the water freezes, and avoid using glass bottles since they can easily shatter when frozen. CamelBak Podium Big Chill Insulated Water Bottle, 25 oz. If you don’t have a favorite sports bottle, consider the 25-ounce Big Chill from Camelbak. 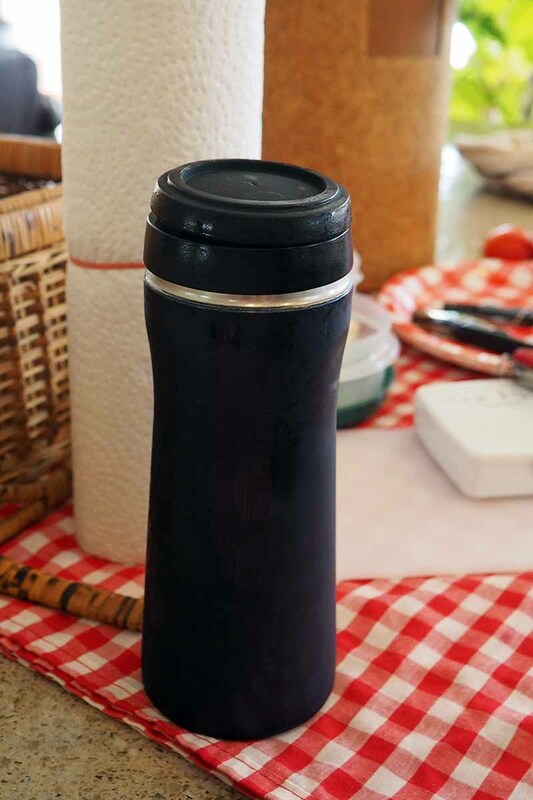 Made from a proprietary blend of BPA and BPS-free plastic, it won’t leech any bottle-flavor into your drinks. You can find it on Amazon.com. 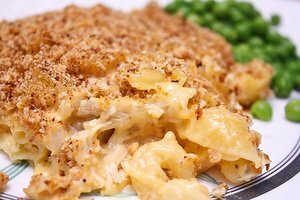 With uneven terrain, spills are pretty much a part of any meal taken outdoors. But, they can be taken in stride by having a roll of paper towels on hand. Plus, they’ll serve double duty as serviettes and won’t blow away in the wind the way a stack of paper napkins will. Pack a half-used roll to minimize the space it takes up in your basket. Or, for an option that’s more environmentally friendly, pick up a pack of cloth napkins instead. 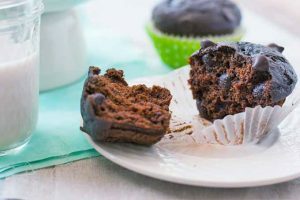 These easily washable cloths fold up easily and they can also do double-duty mopping up spills and wiping faces, while they may of course be used to protect your lap as well. 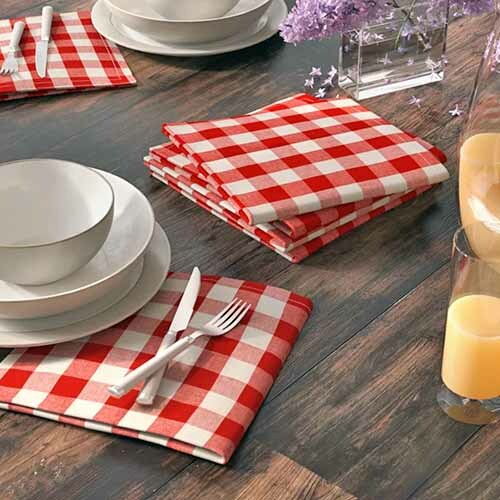 These Arlington checkered cloth napkins from August Grove are perfect for a picnic, and they’re available on Wayfair.com in sets of 6, in a variety of colors. 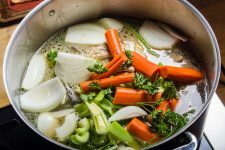 As a rule of thumb, stick to simple foods and dishes that are easy to pack, and avoid those that are delicate in nature or need to maintain a certain temperature – like ice cream. 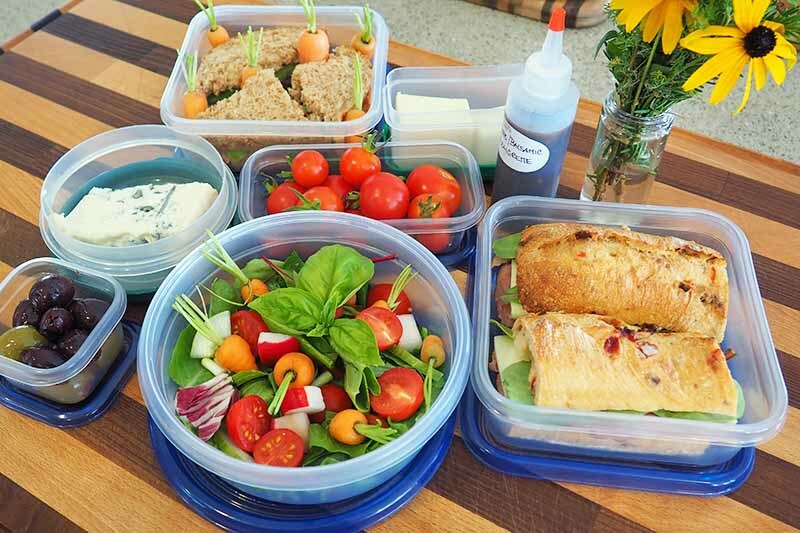 Keep food fresh and preserved in airtight containers. Photo by Lorna Kring. 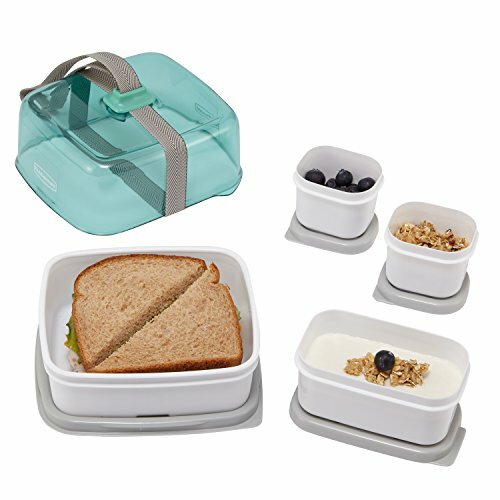 When it’s time to pack your food, choose food-safe plastic containers with tight-fitting lids instead of foil, plastic wrap, or zippered bags – rigid containers do a better job of protecting soft or tender foods like cut fruit and sandwiches, and they have better spill-proof qualities as well. Plus, they’re easier to stack and pack in your cooler or basket. Try these sturdy Fasten + Go containers, available on Amazon. Rubbermaid makes these in a variety of configurations with white containers and tight-fitting seafoam green lids. 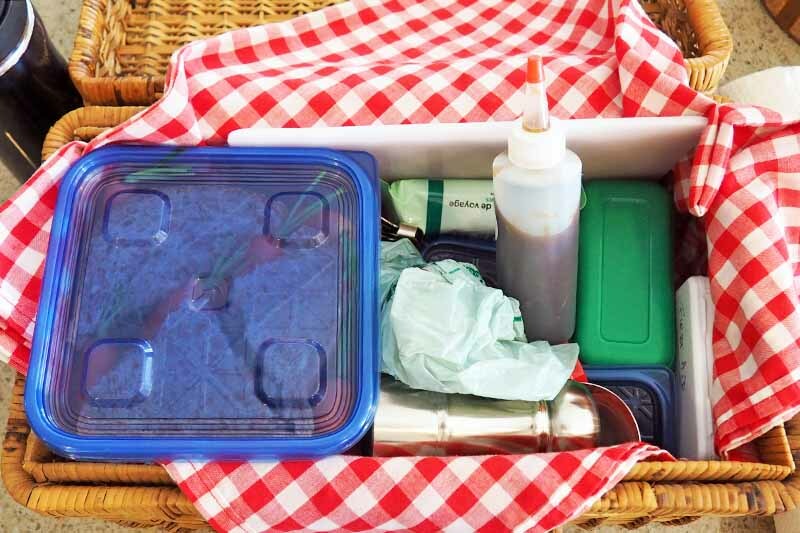 You can choose between an entree kit, sandwich kit, or soup kit with several containers, plus a strap to secure them that eliminates the need for an extra basket or cooler. The convenient strap allows for one-handed carrying as well! 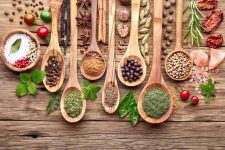 Seasonings might be a small thing, but they go a long way toward making your picnic a success – particularly with foods like coleslaw, fried chicken, or salads. Pick up a small container that holds both salt and pepper and tuck it into the corner of your basket – like this one from GSI Outdoors, available on Amazon.com. 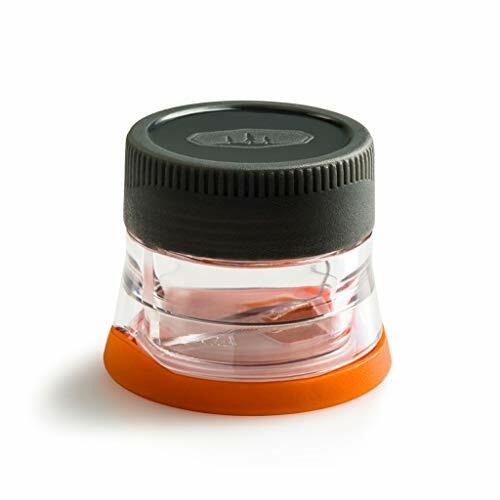 Twin compartments allow single-sided dispensing and a waterproof cap keeps your seasonings dry. 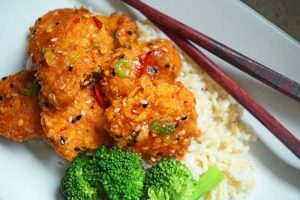 So, along with standard cutlery items of forks, knives, and spoons, remember to pack a large serving spoon or two. We love this set of colorful acrylic serving spoons from Latitude Run. 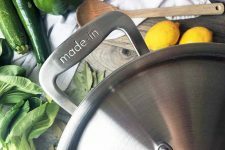 Available in pink or blue, one includes a slot for straining liquids off of pickles or salads, and they’re shatter resistant and reusable. This set is available on Wayfair. Particularly useful for the wine and cheese basket, or if your menu is mostly nibble bits that don’t require individual pieces of cutlery or plates, you don’t want to forget the toothpicks. All the necessary chowing down utensils. Photo by Lorna Kring. Pack a small toothpick dispenser to retrieve cheese cubes, meatballs, melon balls, olives, and pickles from their containers – decidedly more couth than using your fingers! 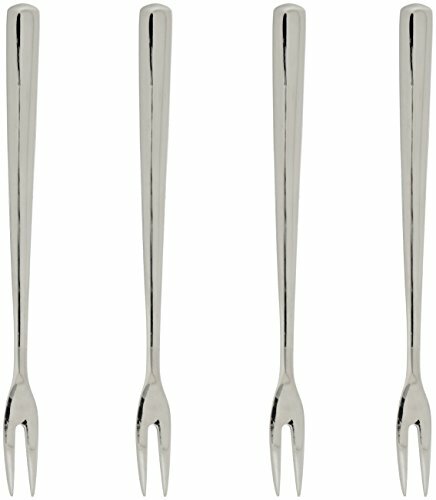 Or, go classy with cocktail forks, like these 18/10 stainless steel bistro forks from WMF Manaos. 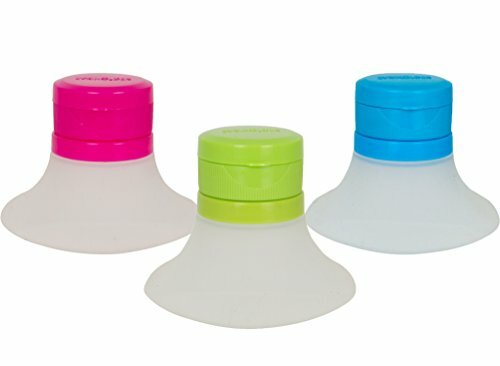 These are reusable, and they’re available on Amazon.com. 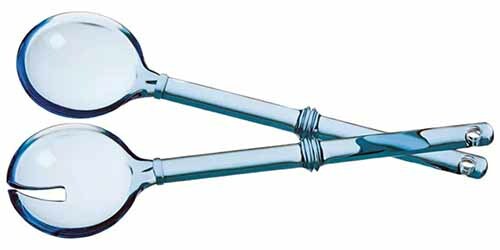 Just 5.5 inches long, they’re easy to pack and add a touch of elegance to your setting. Often overlooked, a couple of trash bags make cleanup fast and easy when it’s time to go home. Use one to dispose of garbage, and the other to pack up any dirty containers, glasses, plates, or utensils to wash at home – just don’t get the two confused when you’re tossing the trash! 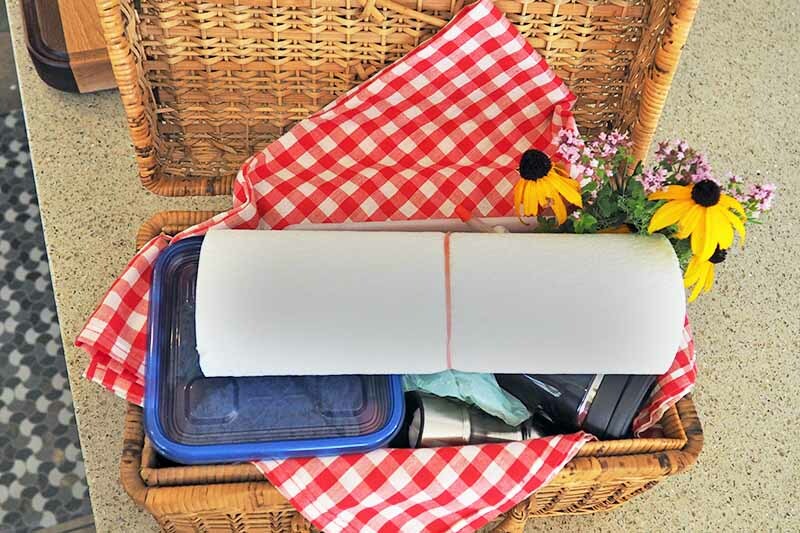 Want to make sure your wrappers and peach pits make it to the right place, without having to worry about the bag falling over, spilling, or becoming lost in the jumble of other picnic goodies and materials at your next gathering? Let me introduce the trash bag stand. This is just what you need to make sure your refuse winds up in the right place, and it’s easy to carry with a folding design that will stand on its own, and a drawstring closure. Line it with a disposable bag, or fill it with recyclable and compostable materials to tie up and bring back home and you’re good to go! The Portable Trash Can with Stand from Always Flying is available on Amazon. 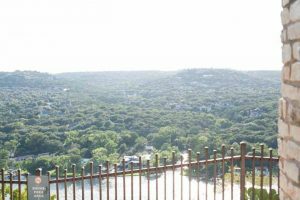 Not every outdoor location has a supply of running water, and a package of pre-moistened wet wipes helps to keep hands clean, or to wipe up any sticky spills and messes. 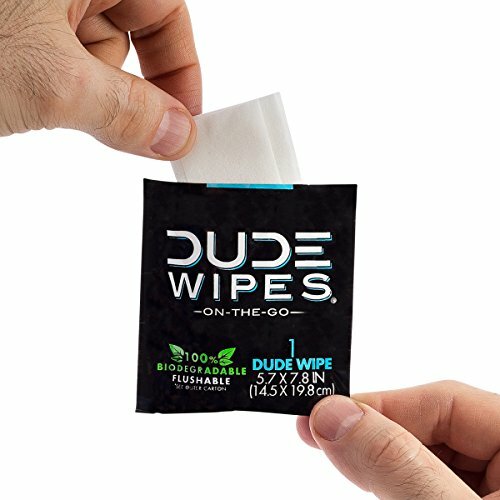 Try the individually packaged option from Dude Wipes, available on Amazon. They’re unscented, hypoallergenic, and 100 percent biodegradable. 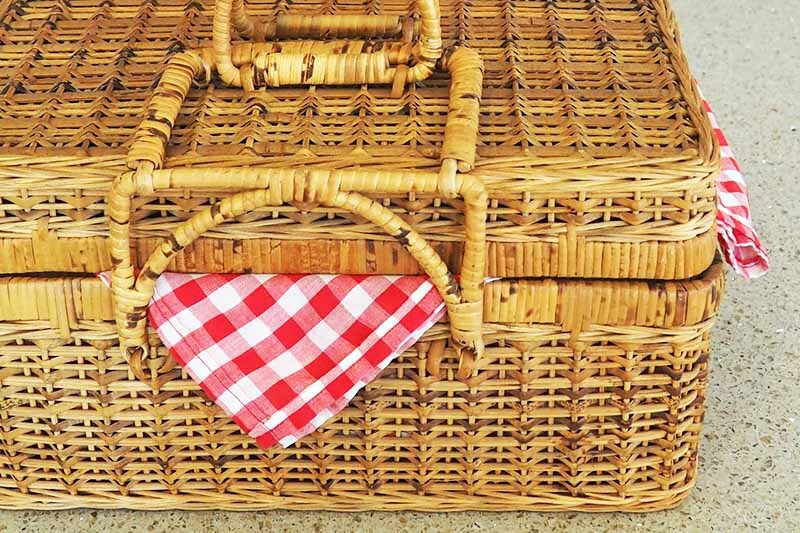 Of course, you’re not required to have a proper picnic basket to enjoy dining al fresco. 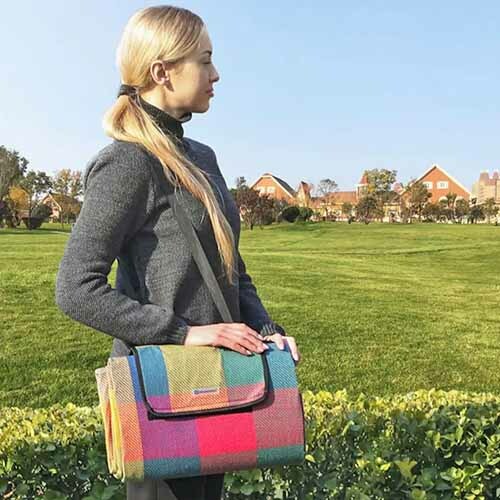 A tote bag will work too, as will an insulated carrier, or a hard-sided cooler – it just won’t have the same panache as a beautiful basket designed for the task! Packed and ready! Photo by Lorna Kring. After all, the key is in the contents. 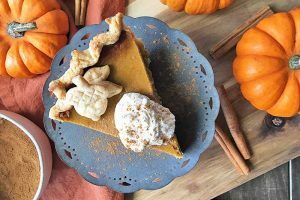 Just remember to stock up on the essentials, review our checklist before heading out, and bring along plenty of good food and good company. If you do want to go for the full authentic wicker and cloth blanket experience, be sure to check out some of the beauties featured in our guide to the best baskets. They make great gifts, too! Are there any other essentials that you think belong on our list? 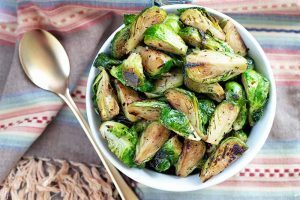 What are some of your favorites to pack up for an outdoor meal? Let us know in the comments below! Photos by Lorna Kring, © Ask the Experts, LLC. ALL RIGHTS RESERVED. See our TOS for more details. Product photos via Freeport Park, Evriholder, Hutzler, Cuisinox, Lipper International, I GO, Victorinox, CamelBak, August Grove, Rubbermaid, GSI Outdoors, Latitude Run, WMF, Always Flying, and DUDE Wipes. With additional writing and editing by Allison Sidhu.